Home > Google News > Misc Google > The Google House? What is going on with Google? Google barges, floating show rooms, renting out spaces throughout various cities and now "The Google House"? This Google House seems to be in London and is there to showcase some of Google's latest products and services to the press and general public. 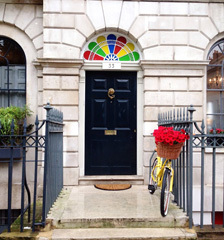 If you do a search on Google+ for #googlehouse you will learn more and see more about this. This Google House is in Paris and was put up on November 13th. Is this what you expect from Google?